Background:I have had this beer several times in the past. I actually bought a 6 pack this time to wet down my pork ribs while smoking them for several hours. 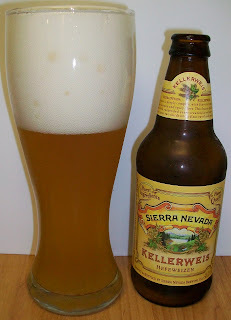 So while the ribs are smoking I thought I would review one of these Hefeweizen brews from Sierra Nevada. Review:The beer pours a hazy golden pale straw color with orange hues and a very rich bright white head. The nose is nice with sweet wheat malt aromas along with notes of clove, banana and yeast. What a nice refreshing beer. This is a little light for an authentic Hefeweizen but it has all the correct flavors for the style. There is a nice sweetness up front on the tip of the tongue then a very pleasant effervescence over the tongue in mid sip. The mid-sip effervescence is also very cleansing and refreshing. The back-end is very smooth and easy drinking; it just glides down your throught with no effort whatsoever. The finish is fairly dry and also a little sweetness that’s normal for a Hefeweizen. The final aftertaste is sweet with yeast, banana and clove notes. The final aftertaste is pretty much taste just like the nose smells. This is going to be a short review. Since this is such a refreshing beer it is not hanging around very long. Well, that’s about it. This was a very good refreshing Hefeweizen. It’s a little lighter than the authentic German counterparts but all and all a very nice beer. I’m going for a B- on this.